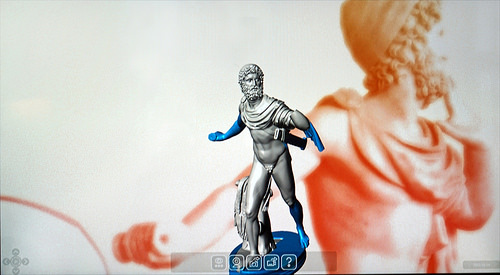 The digitization in 3D of the roman statue of Odysseus (2nd century after J.-C.) inspired by a Greek model of the 3rd century before J.-C. was made by the Italian company Virtualgeo. The model is available for museum visitors on the platform ECH of leisure education for the cultural heritage, developed by Virtualgeo. The parts of the statue restored over the centuries (right arm, coat, left leg, base) were stained to identify them. The model is manipulated by the visitor, either in the form of the mesh network, either in the form of smoothed out, We can change the colors of the background. The platform allows you to send a friend a selfie with Ulysses, but during our visit, this feature was not operable.